Seth Godin and many others are talking a lot today about the connection economy. Here is an excellent short video from Graeme Codrington about this. There is also a great article from Graeme’s colleague Keith Coats here. In this post I explore what I think is the most valuable currency of connection for individuals, relationships, at work, at home, in our tribes, and in our communities from my perspective. We have a hunger for human connection from the moment we are born. For several years most of us do what we think other people want us to. We behave to please. The key to being valued by people who really matter in our lives is to be ourselves, that one-of-a-kind each of us is. Andy Warhol said: "They always say time changes things, but you actually have to change them for yourself"
My pathway for personal change is compete with yourself. Want to change or modify something in your personal life? 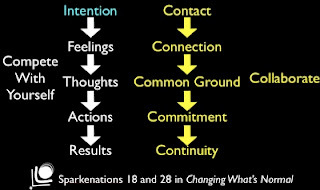 Change or modify intention first, feelings second, thinking third, and then align behaviour and the outcome you want will take care of itself. There are two keys to relationships of high value and mutual reward; serving and shared-view or common-ground. Who are you serving? What value are you delivering? In a organisational sense your customer is whoever gets your work next. Are they receiving the value from you that they demand, desire, and feel that they deserve? In a personal sense we serve others in all kinds of ways. A key question to ask: Is what you are giving to others exactly what they want? There are three worlds. The world in here, that’s my world. The world out there, that’s your world. The world that really matters though is the world we share. In all our relationships we need a shared-view about where we’re going, why we’re going there, how we will get there, and who will do what and when. My pathway for relationship change is collaboration. Want to change or modify a relationship in your life? Change or modify how you make contact with the other person first, how you connect second, how you discover common-ground (shared-view) third. Then align how you demonstrate commitment to one another. The relationship modifcation or change you want and the continuity of the relationship will take care of themselves. You can download a complimentary copy of my Changing What’s Normal book with my compliments by enrolling in the Enhancing Their Gifts System short 3 lesson trial here, or by completing the Doing Your Life’s Work Pulse Check here. Connection is all about who we are. It's about our true selves meeting other people's true selves. There is nothing more important than who we all are when it comes to boosting employee performance. Employee engagement is an outcome of human connection. We must be engaging before engagement is even remotely possible. #1. Only recruit people who live your values or whose personal values are aligned with yours. #2. Professionally induct people into your culture, the way you do things. Sometimes called onboarding you are looking to be so engaging with people that they quickly become on board. #3. Celebrate what's working as well as what's not. Authenticity, candor, honesty, and openness are the currency of the connection economy. They lead to trust which is the bedrock of true collaboration. #4. Help people identify and cultivate their unique gifts/talents. This is your number one role as a leader. When people are bringing who they truly are to their work on a consistent basis high performance is a natural consequence. #5. Co-create with people their unique piece of your strategy execution map. Most strategies fail to get executed because employees, the chief executors of strategy, haven’t yet bought into the strategy or as is more often the case, they don’t yet understand or own their unique piece of the execution map. #6. Fulfill the promises you made to employees when you employed them and make it simple for your employees to fulfill the promises they have made to you and that are articulated in their unique piece of your strategy execution map. #7. Co-create a culture with your employees where appreciation and accountability conversations are integral to daily work. #8. Agree with your employees on what continuous improvement means in the reality of everyday work and never deviate without a shared-view about possible change/s. #9. Ensure that everything you do and how you do it means your employees have continuous opportunity to enhance their gifts and live happier lives. I have made it simple for you to enact these 9 in my Enhancing Their Gifts System - the simple framework that profoundly unleashes employee talent. You can experience the system first hand through a complimentary 3 lesson trial. Straight away you get to download my Changing What's Normal book. Simply put your details in the boxes here to get started on the trial. There is a lot of talk about life-work balance. I think most of it is nonsense. Balance for me suggests equality. There is nothing equal about personal life and work. The facts are we spend about a third of our lives at work. Life-work harmony is possible. 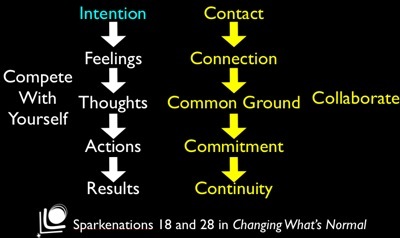 I write about this in sparkenation 26 of my Changing What’s Normal book. The key is this: Do the people living with you truly value you and you them? If your answer is no, fix this first. An unhappy home life spills over into your working life and vice-versa. All the talk today is about online and social-media. Are you being fooled by it? There is value in online. You’re reading this post! Who Google says we are is true, yet only to a point. I see value in online because it can enhance our credibility, visibility and searchability. Sharing online is a great way to give value in advance of a relationship. Online significantly enhances our ability to share, stay in touch and connect. The truth though is that nothing can replace real human connection. There is nothing quite like the touch of another human, a look in the eye, in-person conversation, and everything else that we really value about being alive and sharing our lives with others. Have you spoken to your neighbour lately? Did you stop and chat with your friend you haven’t seen much recently who you bumped into into in the supermarket, or were you too busy, or on your phone perhaps? We can tap into anything, anywhere, 24/7. There are many great advantages to being able to do this. Is it really what we actually want though? I don’t think so. We all want to be loved, valued, and fulfilled. Authentic, in person human connection leads to these things more than anything else. For great insights into real connection please watch this video by Amanda Palmer. One team Enhancing Their Gifts System licence available for just $1320. Find out more here.